Home > Poverty focus 2019. Social Justice Ireland. (2019) Poverty focus 2019. Dublin: Social Justice Ireland. Life on a low income is the norm for a large proportion of our society. One in every six people in Ireland lives with an income below the poverty line. Based on the latest CSO data, this corresponds to approximately 760,000 people. 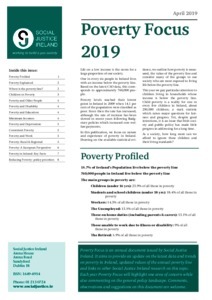 Poverty levels reached their lowest point in Ireland in 2009 when 14.1 per cent of the population were classified as poor. Since then the rate has increased; although the rate of increase has been slowed in recent years following Budgetary policies which increased core welfare payments. In this publication, we focus on nature and experience of poverty in Ireland. Drawing on the available statistical evidence, we outline how poverty is measured, the value of the poverty line and consider many of the groups in our society who are most exposed to living life below the poverty line. This year we pay particular attention to children living in households whose income is below the poverty line. Child poverty is a reality for one in every five children in Ireland, about 230,000 children; a stark statistic which raises major questions for fairness and progress. Yet, despite good intentions, it is an issue that Irish society and public policy has made little progress in addressing for a long time.